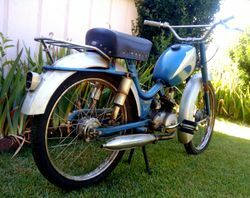 Motauto was an Italian manufacturer of motorcycles founded in 1955 by Vittorio Monaco from Sesto Calende. The Motauto took its name from its body shape which was the shape of a torpedo. The driver sat in the bike like as in a small car. 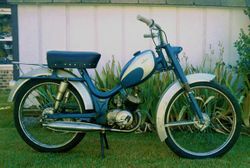 There was a 125 cc two-stroke engine that drove the rear wheel through a chain. The frame consists of two parallel tubes that bend before upward to join with another tube that forms the sleeve. A trellis supports all sections of the body. The engine is placed in the rear of the frame and transmits the motion from the driving wheel, in front of the engine by means of a chain. The suspension is telescopic and the engine is a single cylinder two-stroke 125 cc. The machine was ultimately, the intent of Monaco, have a second seat to the passenger in front of the steering compartment, the space for the spare wheel and luggage. It is not known whether there even after the prototype there was a series of this models made. Other model like mopes were made as well.